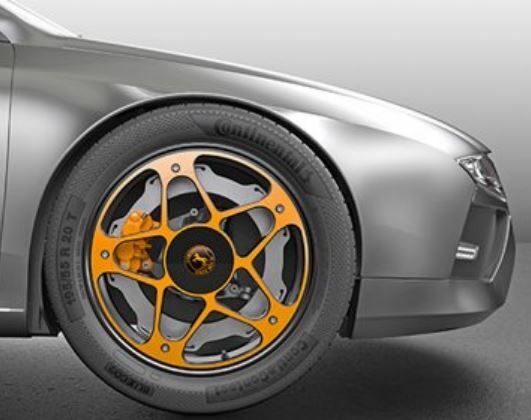 The New Wheel Concept has been designed especially with electric vehicles in mind. The corrosion-free brake discs are made of aluminum and therefore provide for a constant friction surface condition. An important prerequisite for electric vehicles, where friction brakes are not constantly in use. With its innovative design it offers a larger friction radius resulting in smaller and lighter calipers, contributing to lower emissions and a reduction in fine particles. Designed to push efficiency to the limits. For the first time, Continental introduces an innovative wheel and braking concept for electric vehicles. New division between wheel and axle: Continental presents the New Wheel Concept, which optimizes the braking system specifically of the electric vehicle (EV). The design enables the use of a large aluminum brake disk and solves the problem of bad braking performance due to corroded brake disks. The dual New Wheel Concept also reduces the weight of the wheel and brake and reduces service costs due to a lifetime brake disk and an easy brake pad change.